Father, guide us, as you guide creation according to your law of love. May we love one another and come to perfection in the eternal life prepared for us. Grant this through our Lord Jesus Christ, your Son, who lives and reigns with you and the Holy Spirit, one God, for ever and ever. Amen. I am the Savior of all people, says the Lord. Whatever their troubles, I will answer their cry, and I will always be their Lord (Entrance Antiphon). 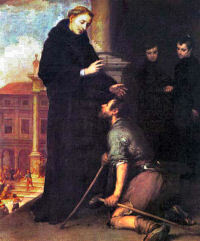 Before the reform of the General Roman Calendar today was the feast of St. Thomas of Villanova (1488-1555), a great saint of the Spanish Renaissance and a good friend of Emperor Charles V. He was a man of infinite charity in word and deed, he lived as frugally as the poor who benefited by his unstinted almsgiving. While provincial of his order in Castile, he sent the first group of Augustinians to the Americas. Establishing themselves in Mexico, they were integral in the growth of Christianity in the New World. This date was also the commemoration of Sts. Maurice and Companions, Christian soldiers who were massacred in Switzerland because they refused to offer sacrifices to pagan gods.